Indiana is fortunate to have a number of strong networks focused on education technology, and each seems uniquely tuned to a particular audience. Education professionals who put a premium on integrating technology into teaching and learning are likely connected to one of these networks via their favorite acronym. (HECC, ICE, #INeLearn) What's yours? I've frequently said that it is because of the sharing that happens in these networks that Indiana repeatedly makes a strong showing in measures such as National Speak Up and the epic-ed map. Last week a cohesive group of technology leaders strengthened their network by coming together to learn from one another. The Indiana CTO Council is the state affiliate of Consortium for School Networking (CoSN) and primarily consists of Chief Technology Officers and Directors of Technology. If you hold the decision making seat for technology in your district, this is a great group to connect with. At both the state and national level, this organization is focused on professionalizing the field and strengthening the edtech decision-making process. Their spring conference included a keynote by State Superintendent Ritz, a team award presented to East Noble leaders, and a number of sessions ranging from social media to data analytics. I teamed up with Brad Fischer of Danville to facilitate discussions about what makes 1:1 or BYOD initiatives successful, and Brad's questioning uncovered some of the key ingredients that make up the "secret sauce." From discussions with these experienced participants, it was clear that knowing why you are implementing technology is the piece of the puzzle you should start with. Also high on the list is establishing a strong team and distributing leadership in a way that allows them each to own the initiative. This goes hand in hand with a culture where everyone is on the same page about goals and expectations. Another piece of the recipe for success is a strategic focus that will indicate what you should do, as well as what you should avoid. And it probably goes without saying that you won't make it far if professional development isn't a part of your plan. That's the recipe we came up with. Drop us a comment and let us know what you think the 'secret sauce' is! But it turns out that we do. We've started the eLearning Pulse to serve two very important needs in our communication strategy. The first is simply sharing the learning that our team is fortunate to experience. This week alone we attended the second all DOE staff meeting of the Ritz administration, as well as a gathering of Indiana Chief Technology Officers sponsored by CoSN. In the future we'd like to use this blog to provide a window into these opportunities for those who aren't able to attend. 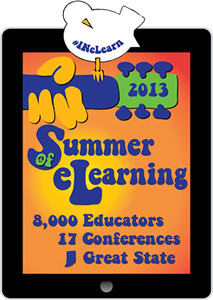 This summer, such opportunities will flourish during the Summer of eLearning. Our team is set to take the "Peace, Love, and eLearning" tour of all 17 sites across the state, and as we pile into our VW Bus (really just Candice's Prius) we'll do our best to take you every mile of the journey. The second need is that for a feedback loop regarding eLearning developments which are moving rapidly forward. One such move is our recent collaboration with My Big Campus. Their offer of free access to Indiana will undoubtedly strengthen the momentum in our state toward digital resources. Our hope is that this blog will be a way for us to communicate the context for these developments, as well as a way to gauge their usefulness to you in your work. I hope you will use comments to respond to the ideas you find here, as well as suggest new avenues where our work can support yours. Ethereal theme. Theme images by Josh Peterson. Powered by Blogger.